Please telphone me (see CONTACT tab above) if you are interested in buying any boat listed below. All other boats listed are sold already. NOTE: All boats have individual specifications and prices vary accordingly. Click the pic to view gallery of pictures on Flickr. Formerly a demonstrator of mine this boat has since been owned by one person only and is well cared for. She was always dry sailed and rinsed down with fresh water after sailing and has been kept under cover, hence the good condition. 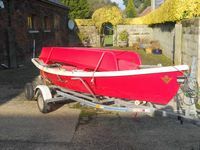 If you are interested in this boat that is for sale for �500 and is lying in Cheshire please call me, Steve Walker, urgently on 01244 676188 or 07985 043981 or use the Contact page. Ring me NOW. This is a fine family boat and great value! Hull and deck white with blue antifoul upon epoxy primer so impossible to get osmosis. 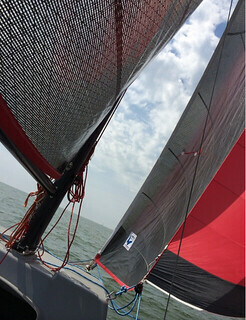 2 reefing points in main sail. Blue & white gennaker, the head sail you will use the most after the jib. Goacher made luff sock to cover jib and protect it from UV. Lazybag for tidying up the mainsail when you are on a mooring or at anchor or indeed left on hard standing ready to launch. Original mounting bracket for short shaft outboard motor. 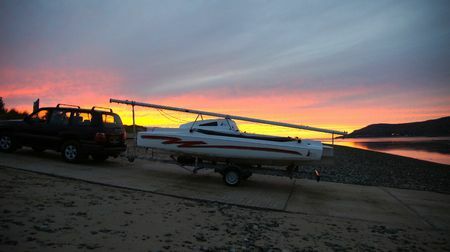 Original PAM unbraked (low maintenance) Road Trailer with lights & suspension & rollers for Magnum 21 trimaran. 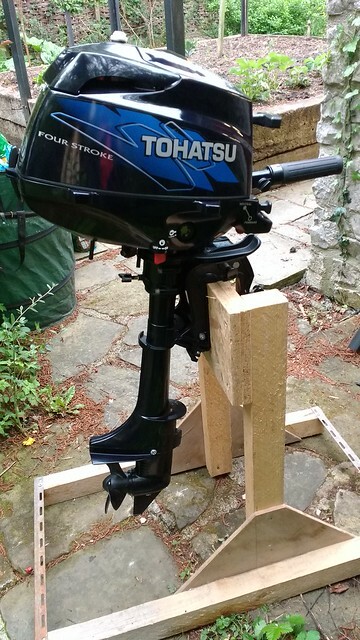 Tohatsu 6HP four stroke outboard motor with integral fuel tank. Telescopic tiller extension (for single handed sailing). And the boat is lying in Cheshire! 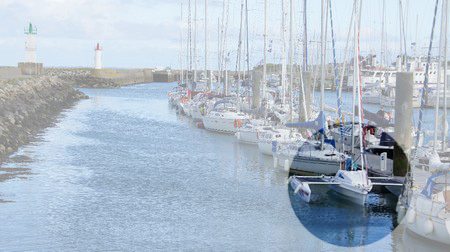 Call 01244 678166 or 07985 043981 NOW to bag this boat NOW for this season. I have seldom seen a used boat in better condition. I believe there is a superficial scratch on it somewhere but I cannot see it in these photos even though the owner claims it is there in one of them. 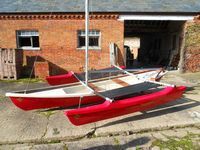 If you are interested in this boat that is for sale for �995 and is lying near Sheffield in England please call me, Steve Walker, urgently on 01244 676188 or 07985 043981 or use the Contact page. Do it NOW. 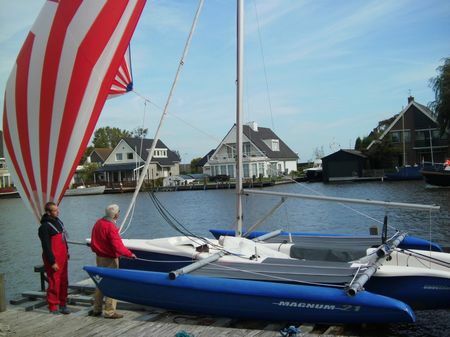 This is a beautiful boat at a great price! Hull coloured Blue and deck coloured Grey. Reefing points in main sail. 2 medium size Magic Marine trapeze harnesses. Mounting for short shaft outboard motor. 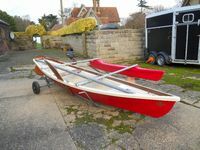 Original PAM Road Trailer with lights & suspension & rollers for Magnum 18 trimaran. 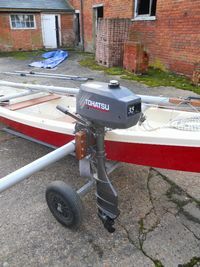 Tohatsu 3.5HP four stroke outboard motor with integral fuel tank, hardly used and recently serviced. Gennaker Kit 13m2 including furler, sheet, halyard and fittings . Spare wheel & bracket for trailer. 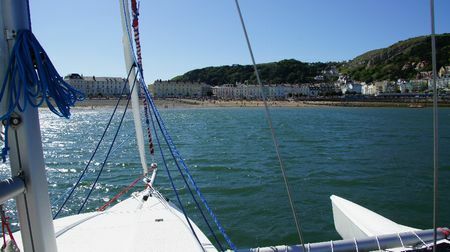 And the boat is already in England! 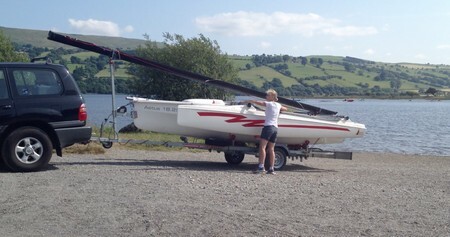 100kg lighter than standard boat !! SAVE 34% on the cost of a new boat. 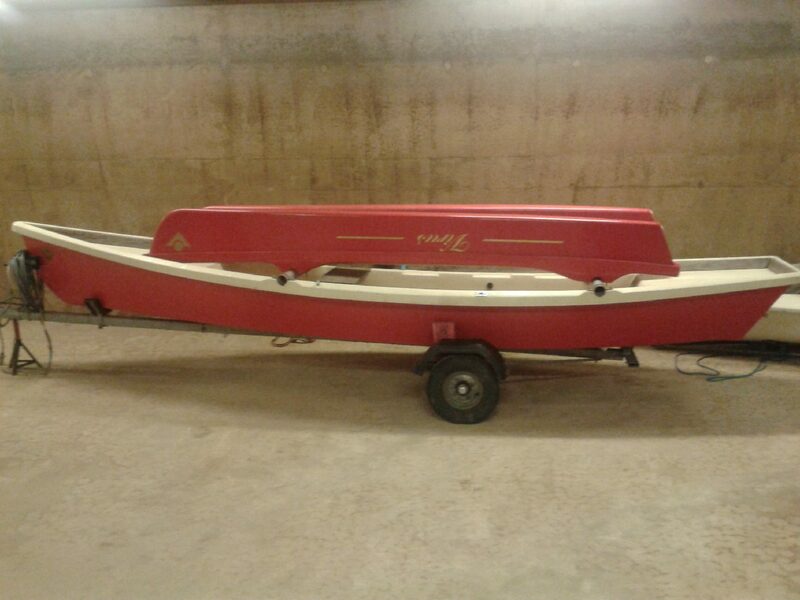 If you are interested in this boat that is for sale for 23,500€ and is lying in Cologne, Germany please call Steve Walker urgently on 01244 676188 or 07985 043981 or use the Contact page. Do it NOW. This is a pristine, high spec. 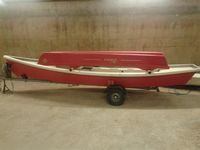 boat in "as new" condition at a great price! The price of this boat NEW TODAY would be 35,525€! Length: 6,00 m / 19,68 ft.
Trailer: break back trailer with brakes, lights, winch and suspension. Motor: No engine is for sale with this boat. Call 01244 678166 or 07985 043981 NOW to bag this boat NOW. 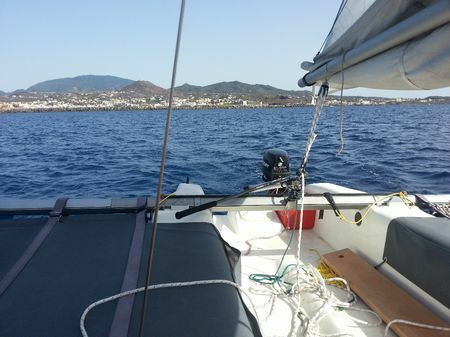 SAILING: jib, mainsail, self tacking jib system, Mast actuator, 17m� Pentex - lath Square-Top, 7m� jib on furler, 20m� gennaker on furling carbon rig. Retractable bowsprit. The boat is equipped ready for spinnaker. 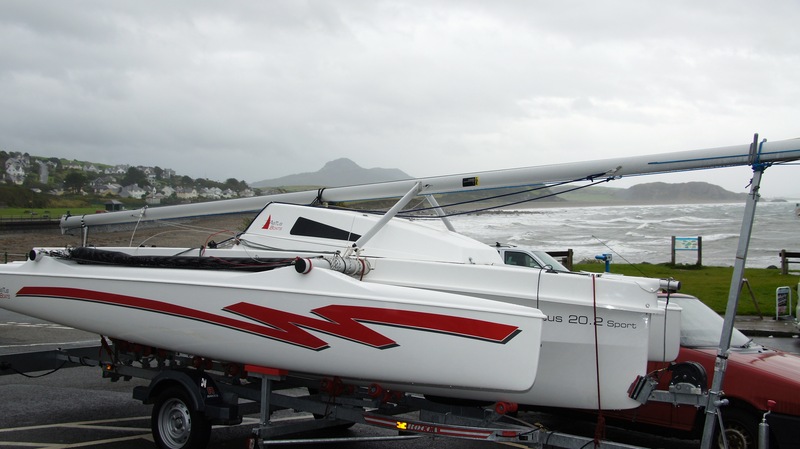 This trimaran has rarely been moved and was probably only about 6 x on the water for a maximum each time of 1-3 days. 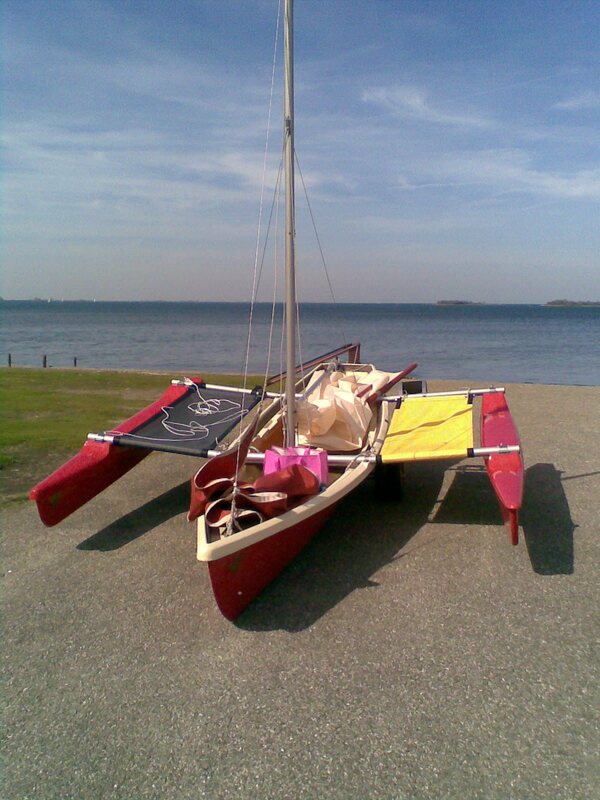 This is a very complete boat: 5 sails (main, 2 jibs, gennaker, asymmetric spinnaker), Mercury engine 5HP, and trailer. It's too late to CALL Steve Walker, on 07985 043 981 to buy the blue boat pictured below as it is SOLD already. the new owner drove to Sicily for an all too brief holiday there and then towed it home! 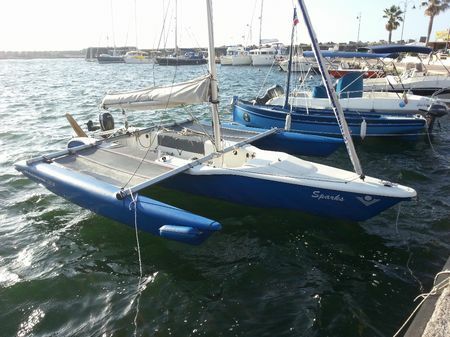 The asking price was €13,300 euro or £9,500 GBpounds, which was very reasonable for such a well equipped trimaran in the most beautiful colours that VirusBoats ever used. 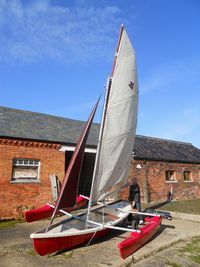 If you want to get a feeling of the fun you can have with a boat like this then check out all the entries I have made in my sailing blog. When I look myself at that long list of entries I am flabbergasted actually. So talk with me if you want answers to any questions. Fully battened, mainsail with reef. 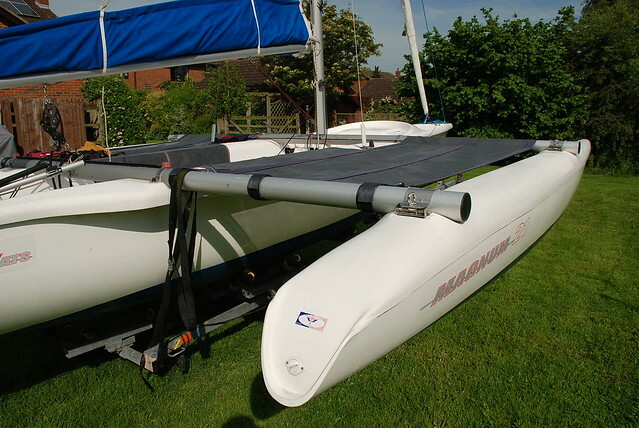 Lazybag helps reduce the time it takes to get sailing if you leave your boat on a mooring or on hard standing with the mast up. Jib and forestay mounted on furler. Jib cover, providing additional protection from UV for the jib, which should already have a sacrificial strip on it. The mast is easy to step and lift into place, even when you are on your own. Gennaker (a very useful sail) mounted on a continuous loop furler so you never run out of rope no matter how tightly this lightweight sail is furled. Clam cleats for spinnaker guys. Optimum size 5HP outboard motor. 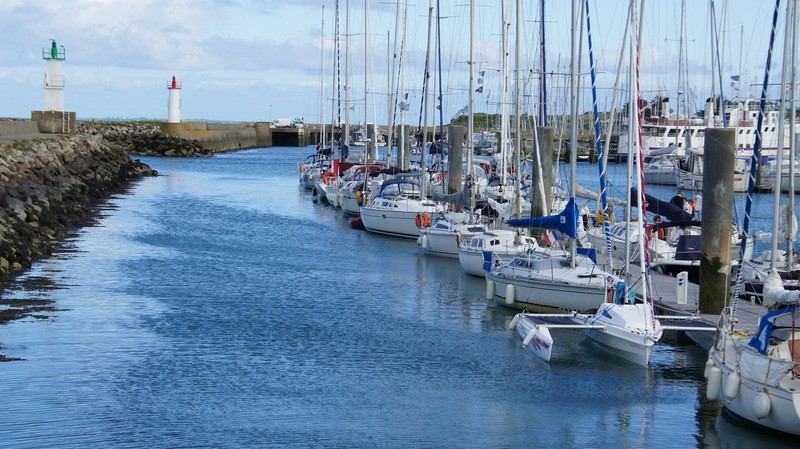 The early boats were usually fitted with 9.8HP 2 stroke engines but these are no longer permitted. But too powerful an engine makes it difficult to control the boat at slow speeds without continually knocking it out of gear so the 5HP is great and will still give 7.5knots, which is plenty. Mainsheet tackle and mainsheet traveller. Unbraked road trailer which means minimum maintenance and it can be towed by any car weighing more than 1300kg. 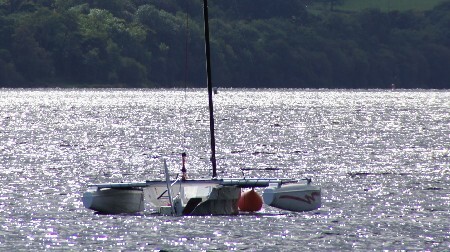 This boat had hardly been used because the owners children were not interested in sailing! Too late to CALL Steve Walker NOW, on 07985 043 981 for a demo of this beautiful 18.2 SPORT. It's gone. 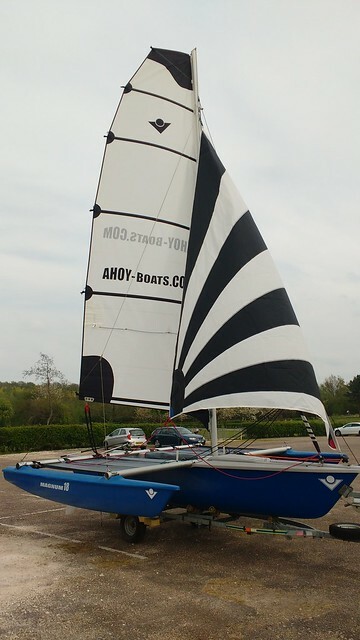 Fully battened, mylar (pentex) mainsail with 2 reefs so safe in all weathers. Mylar (pentex), zip-on jib mounted on furler. Jib cover so you do not have to remove the jib when you leave the boat on a mooring. Anodised aluminium wing mast for improved power and better sail shape at the luff. This mast is easy to step and lift into place, even when on your own. Gennaker (used only once) on a continuous line furler on bowsprit so you can always put it away no matter how tightly it furls. Road Trailer with spare wheel, lights and winch & rollers for launching (without brakes so low maintenance). 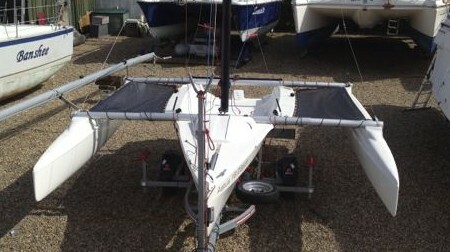 SOLD "Level sailing. Thrilling without spilling." 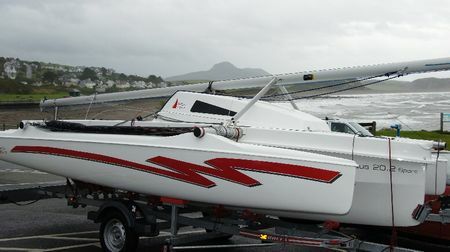 This boat was used on "Practical Boat Owner" test. Too late to CALL Steve Walker NOW on 07985 043 981 to BUY this 20.2 SPORT below as it is SOLD. Fully battened, dacron mainsail with 2 reefs. Dacron, zip-on jib mounted on furler with endless loop furling line. Gennaker (used only once) also on a continuous furler on bowsprit. Aluminium mast with spreader and inner and outer shrouds, the former are mainly for safety in mast stepping and the latter attached to akas act also as back stays. Stainless steel mast support for transport. Aulminium bar for solo mast erection. 5HP 4 stroke Tohatsu outboard motor with separate tank. 6 block mainsheet tackle and mainsheet traveller. Matress and bunk plank so 2 can sleep aboard in the cabin. SOLD. "You will never feel safer sailing fast than in this boat." This boat was originally only a proa and that is why the trampolines are different colours. Lying the Netherlands. This will be a very safe and easy boat to rig, launch & sail. A great introduction to both sailing and to trailerable trimarans. Part battened, 10m2 dacron Gunter Sail with reef. Aluminium mast with forestay and shrouds. Outboard motor mounting bracket on port aka. Road Trailer (without brakes so low maintenance), lights. The TENDER CLOSED at NOON on Monday 12th August 2013.
and this boat has been sold for �700. This boat was originally a demonstrator boat for Ahoy-Boats so it has all the extras. Two owners later this excellent starter boat was available again for somebody else to enjoy. 4 boats in one! Trimaran, Proa, Kataram and Dory. Fully battened, 14m2 dacron Gunter Sail with reef. 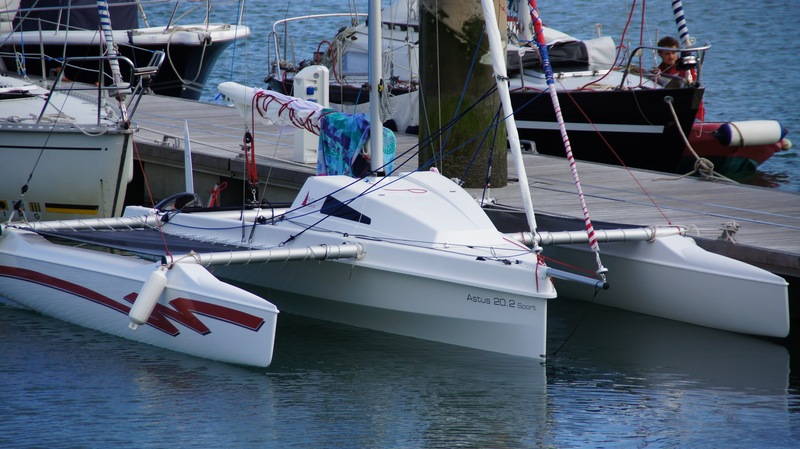 Proa Kit to convert trimaran into a proa. 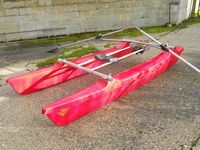 Rowing Kit to convert the two floats (amas) into a revolutionary sliding-rigger rowing catamaran, The Kataram. Outboard motor mounting bracket on port aka of both the proa kit and the trimaran kit. 3.5HP 2 stroke Tohatsu outboard motor with integral tank. Piggyback Road Trailer and launching trolley, lights (without brakes so low maintenance). The TENDER CLOSED at NOON on Monday 25th March 2013. The boat was sold for �700.